On March 17, 2010 in Shanghai China, Filipino Chef Ariel Manuel will compete against the best Asian Chefs from Japan, Singapore, Malaysia, China, Indonesia, Korea, Vietnam, Thailand, India and Cambodia at the Bocuse d’Or Asia Finals. Only the top four of the Bocuse d’Or Asia Finals will have a right to compete against the top 24 teams of the world at the Bocuse d’Or World Finals in Lyon, France on January 2011. 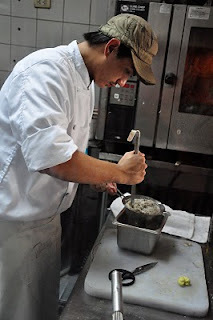 Lolo Dad's Chef Patron Ariel Manuel and Apprentice TJ Abello have 3 hours to prepare 14 portions of their selected menu: Norwegian Halibut with King Crab, accompanied by Foie Gras en Croute and Asparagus and Caviar Custard. This dish will be presented on a specially designed platter made by metal artist Mike Aguas. Head Coach for this team is French Chef Cyrille Soenen of Restaurant Cicou, joined by Chefs Othmar Frei of Santis/Werdenberg, Fernando Aracama of Encore/Canteen/MyThai and J. Gamboa of Cirkulo and Milkyway Restaurants. The Bocuse d’Or is one of the world’s most prestigious culinary competitions, founded in 1987 by renowned French Chef Paul Bocuse brings together the best chefs from all over the world to Lyon France to celebrate French Cuisine. Since 2007, the LTB (Les Toques Blanches) Philippines Culinary Team has had great success at culinary competitions in Hong Kong and Singapore wining top prizes and numerous medals and trophies for the Philippines. LTB is committed to the training and development of the Filipino Professional Chef. CHEF Ariel Manuel is one of the most creative and cutting edge chefs in the country today. Let's wish him and his apprentice TJ Abello good fortune in the Shanghai competition. Proudly Pinoy! Wow! That's awesome! Proud to be Pinoy! =D I wish them so much luck and all the best. Good luck guys!